Jake Greenspan, son of Dr. Stanley Greenspan, who created the Developmental, Individual differences, Relationship-based (DIR) model, has devoted his career to his father’s legacy. He is based at The Floortime Center in Bethesda, MD and has recently published a manual about his father’s work, The Floortime Manual. While this is not meant to be a comprehensive summary of Greenspan’s Floortime Approach, it is a great overview and a handy reference book. It complements the online Floortime Manual, an interactive guide where parents and practitioners can explore the model, take quizzes, listen to audio from Dr. Greenspan himself, and watch videos to solidify their knowledge of the approach. The introduction of the print manual is a chapter describing the scientific support for this approach. Jake starts with the point that the ideas Dr. Greenspan had in the 1970s (that emotional experiences drive development) have been supported by the last 50 years of neurological research. Touching on the research on neuroplasticity and the lack of generalization of typical behavioural interventions, Jake then points out that behavioural, repetitive, adult-led interventions actually impede future learning by creating maladaptive rigidity. On the other hand, The Greenspan Floortime Approach “can change and rewire how the brain is organized” in a positive way to promote relating, communicating and adaptive, flexible behaviour. Next, Jake describes and extrapolates from a number of principles of neuroplasticity how Floortime supports the brain’s development in adaptive and flexible ways by fully involving the child, integrating information, promoting thinking over memorization, working from where the child is at developmentally, giving the ‘just-right‘ challenge, expanding interactions, giving the right kinds of rewards, involving parents, and applying consistency and intensity. He concludes by reminding us that Dr. Greenspan did describe emotions as the foundation of intelligence and that empathy and flexibility are key to promoting relating, communicating, and thinking. What we all want for our children is to become successful adults who have these capacities over rigid and repetitive sets of skills. The next bulk of the book covers the foundations of Greenspan Floortime. It covers the steps of Follow the lead, Challenge, and Expand, types of play, and a description of regulatory profiles. The manual is quite useful in breaking down how to approach Floortime with the regulatory styles of children, and the types of play children are doing. You can essentially flip to the page of the profile of the child you’re playing with to see how to carry out each of the three steps of following their lead, challenging, and expanding. The manual ends with two short Appendices including a cheat sheet describing key components of Floortime, and Greenspan Floortime block schedules that cover how frequently and for what duration to implement Floortime. What you won’t find in the manual are specific descriptions and discussion of the functional emotional developmental capacities and the components of The Learning Tree. Beyond a brief list naming them, they are not the focus of this book. There are training courses that you can take at Dr. Greenspan’s website to delve more fully into the model and practice. There are two things that I find most useful about this book. The first are the examples provided about how to do Floortime, broken down by your child’s regulatory style and type of play. I can look up the Under-reactive Seeking Child section and read about the things that, indeed, my child does on a regular basis. Why it’s so helpful is that it reminds me of the most important aspect of Floortime with my child: making sure that my child is getting his sensory input within a social exchange rather than doing these behaviours on his own. He requires the social exchange to develop the long-term regulatory skills required for his emotional regulation. Also, because my child is not yet able to communicate these sensory needs to me, and might not know how to seek out the type of stimulation his body is craving, I need to be the one to be proactive in helping him fulfill these needs. The other sections tell me how to do just this. I can look up my child’s profile in the How to “Follow the Lead” section and in the Challenge and Expand section. Within each section, I then have three more sections: sensory play, object play, and symbolic play. Within each, I can read how to do Floortime. Our son is fully in object play but starting to creep into symbolic play, and he used to be in sensory play. So I find these descriptions very helpful as they are a bit more personalized to my child. The second main thing I like about this book is the constant focus on the essential aspects of Floortime. Jake has grave concerns about different versions of his father’s model that are out there and holds tight to what he says is the only version of Greenspan Floortime. This manual highlights what he means by this. He details the misconceptions of what Follow the Child’s Lead means, the misconception that you should not talk with non-verbal children, and how too many adults follow the child’s lead to motivate the child, only to then try and teach them something specific–which is an adult-led “skill building” activity, certainly not Greenspan Floortime. Jake holds anyone claiming to do Floortime to very high standards, and this is important for at least two reasons: this was his father’s work and he does not want it misrepresented; and second, we need the high standard to ensure that we continue to implement Floortime the way in which it was designed. In sum, I like this manual a lot. It’s certainly not the only thing someone who wants to do Floortime should read or do, but it’s very helpful. I especially like the constant emphasis put on the necessity of making everything a playful interaction with my child, combining all words with actions, not directing, and not teaching skills. (The latter two will not have the desired outcome.) When you can easily get caught up in developmental levels and other details, this book reminds me of very important aspects of Floortime. 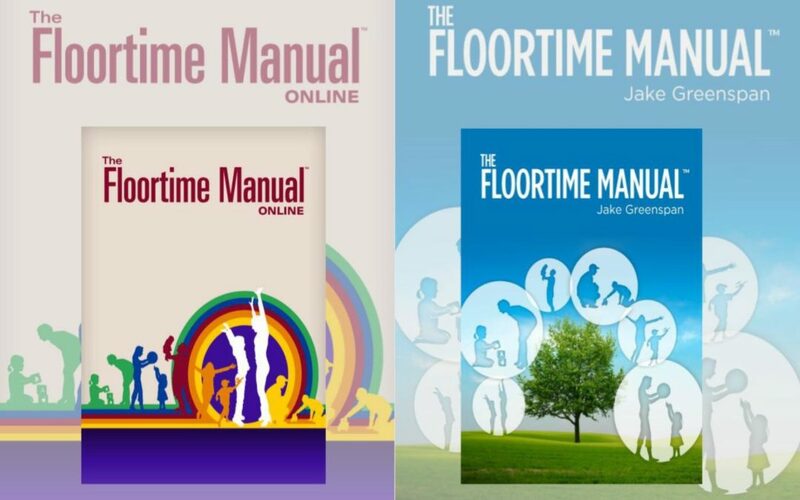 If you enjoyed what you read above, and/or found it helpful, you can purchase your copy of The Floortime Manual and sign up for courses HERE. Please consider sharing this post to Facebook or Twitter. If you have any comments or questions, please consider typing them into the Comments section below. That manual sounds like a valuable resource. Based on your review ~ we have ordered a copy for our family. Thank you for the continuous flow of information!